Organizing stuff has always been one of my weakest points. I just don’t see the problem–if I can stand the “organized clutter” around me, how come other people can’t? Okay, so admittedly, clutter can be an eyesore. Whip up this quick little canister to store little knickknacks: paper clips, loose change, candies, and what-nots. Thanks to the basketweave stitch, the interesting and textured design gives the canister a unique look (that is actually easy to make). If you have any questions, just leave a comment below and I’ll get back to you when I can. Happy crocheting, everyone! 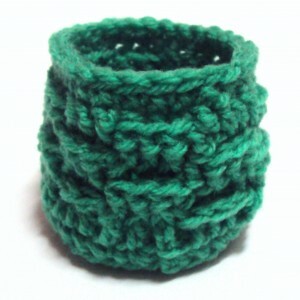 This entry was posted on Sunday, July 3rd, 2011 at 12:57 PM by Claire Ortega-Reyes	and is filed under Free Crochet Patterns. You can follow any responses to this entry through the RSS 2.0 feed. You can leave a response, or trackback from your own site. Going to make one right now! What a sweet little pattern! Please! If you put paper clips in there, you’ll never get them back out! I just made a batch of Plarn cozies using Rachel’s pattern. I agree with Nancy that this pattern would make make nice yarn cozies. I’m making this in the hopes of keeping my scraps of yarn (for stitch marking) all in one place! Neat, although for a true basket weave round 4 should read “fpdc in next 3 dc” instead of “2” ? Thank you Claire! I’ve been wanting to make some more mason jar covers, but I didn’t want to use the same “pattern” that I used before. With this pattern, you have just given me the idea of enlarging this pattern to fit quart size mason jars. I made the bottom in a spiral. And used a size G hook with scrap yarn and 108 stitches.